Something I've done in recent years to help me through the worst of my bad days, weeks or months, is make art journals - at least I think that's what they are. I don't know what else to call them, anyway. I haven't done it much over the past year, more just the odd page here and there, but it's something I know I can fall back on when I feel like I really have to vent in a way that's healthy. I use the Ryman Soft Cover Sketchbooks which are A4 in size and contain 80 pages. They're lovely quality, and I like that it has the elastic loop on the front to keep them closed - I use so many different textures and fabrics, a few of my more recent journals have become so fat and won't stay closed without the elastic loop around it. 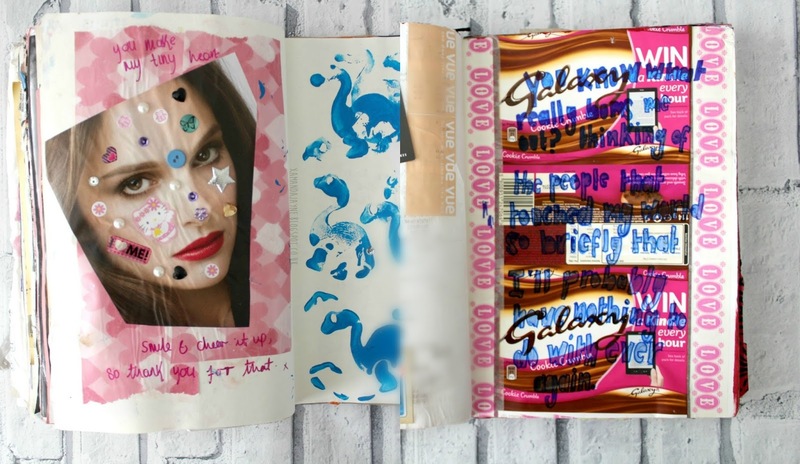 So, in today's post I just want to share some of my art journal tips with you! If you're interested in starting one, have creator's block, or simply just need some new ideas - I hope this helps you out! 1. 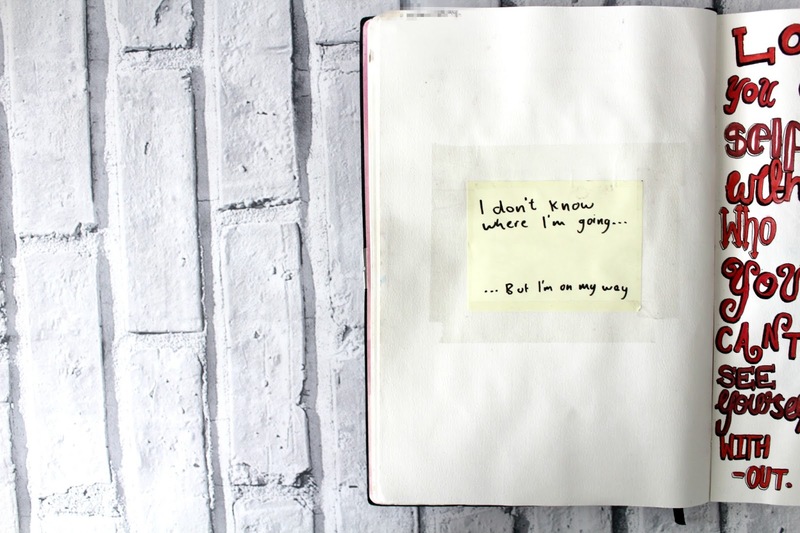 Flickr and Tumblr are some of the best places to find art journal inspiration. I used to get a lot of my quotes, background images and celebrity pics from Tumblr, but I don't have an account anymore as I find Tumblr to be quite a toxic place online - this is kind of a big pain as it's harder to come across good images and words I'd like to use. I imagine Pinterest would be handy if you have it too - but I don't use that either haha. 2. Use whatever you can get your hands on! Bubble wrap, old fabric - I cut up old clothes with interesting patterns on -, tissue paper, duct tape - it comes in all sorts of cool colours and patterns these days -, doilies and chocolate wrappers - I've used the outer wrapper of a Galaxy bar below - make for some really unique and interesting textures, patterns and effects. I've even used plastic bags! Sorry for the awkward blurring, but, receipts. 3. Be sure to raid the stationary aisles in supermarkets - children's craft activity packs can be really useful, cute and cheap. I got a pack of dinosaur-shaped sponges out of Sainsbury's for a few quid, and you can get really awesome sticker packs from supermarkets too usually. Not to mention glitter pens and sprinklers, chalk, highlighters, and coloured paper and card packs, all of which are usually reasonably priced - whereas places like WH Smith and Hobbycraft can be a little more expensive. Adding strips of colour to your plain paper can add a little something, whilst PVA glue makes for a hard-coated glossy page. Fabric paint, foam, and glitter paint all add 3D texture. 4. I also love buttons, metallic markers and chalk pastels - especially over dark photos or backgrounds. 5. Combine your love of all things beauty-related with your art journal by making page backgrounds with lip prints in your favourite lipsticks. I've also used nail polish drops on a background before to add texture. 6. Don't be afraid to get messy! I love coating pages in acrylic paint, and have even painted myself so I can make hand prints! 7. If you can write legibly with your other hand, it can make writing quotes a little more interesting - I find it adds an almost child-like charm. 8. I love making my journals somewhat 'interactive' by using flip up/open photos or bits of paper with things written inside/underneath, or gluing in envelopes with notes insides. Above I made a mini poetry book out of an A4 bit of felt and lined paper, securing them together by punching holes in them and tying a ribbon. 9. Highlighters make for seriously bold and bright backgrounds (see the first photo of this post), whilst watercolours add a simple wash that doesn't distract from whatever you're adding to it. 10. I enjoy writing over old notes, and using old newspapers, wallpapers and wrapping papers as backgrounds. I also have pages of old keepsakes, receipts, stickers and clothing tags - just because. 11. Collages are really simple and effective. You can add quotations to your images in so many different ways! 12. Magazines are good to cut out from, especially particularly fashionable or artistic ones. I used to buy Company regualrly, but now that it's no longer a magazine, I tend to just buy a couple of expensive magazines like Vogue and i-D every so often instead. 13. Old CDs you don't listen to any longer - or never have - can look really kitsch and cute with added stickers. Alternatively, burn your own playlist to keep in a pocket in here so you cna listen to it to remind yourself of certain things - maybe tracks that make you particularly happy or remind you of your favourite holiday. 14. Sometimes I just want to paint a really colourful page and not take away from it, so I add quotes or lyrics or song names to add something. 15. I find it effective when I lightly paint a page/leave it blank, and then have a small doodle or quotation in the corner or on the side. I gave my journal to my friend and asked him to write something in the box. Paint splatters are so fun! I spent my college days drawing triangles like these and colouring them in. They make awesome backgrounds. That's a wrap for this post - I hope you found this helpful or interesting or, hell, maybe even a little inspired? My art journals are incredibly private for me, so I chose to just share with you the pages I was comfortable, most of which aren't very personal. I wish I could show you some of the more personal ones as they're some of my favourites, but it's not something that's on the cards right now. Anyway. I hope you guys liked this post! Thanks for reading!